An unbiased, impartial Justice system is the perfect setting to bring light over these unfortunate fatalities. Bolivia has certainly not have a Judicial probo. Social unrest sprouted after evo, Mallku, Patana, et al., from other radical leftist organizations gathered and decided to promote turmoil and defy the democratic structure in Bolivia. Who incited violence? Who decided to call to the streets with such violence so as to demand “retaliation”? Who benefitted over the long-run on these violent clashes? Who was behind all of the above? Only when these are answered we may come to closure. The above opinion belongs to Bolivian Thoughts. A former president of Bolivia and his one-time defense minister went on trial Tuesday in connection with a lawsuit filed by family members who they say their relatives were indiscriminately shot by the military in a heavy-handed attempt to quell civil unrest in 2003. The federal case against former President Gonzalo Sanchez de Lozada, and his former defense minister, Jose Carlos Sanchez Berzain, has been pending since 2007. It was brought by families of eight people shot and killed under the Torture Victim Protection Act, which authorizes lawsuits in the U.S. for extrajudicial killings in foreign countries. In their opening statements to the jury, attorneys for both sides gave competing versions of events in the fall of 2003, when a series of sometimes-violent protests in Bolivia over use of the country’s vast natural gas reserves came to a head. Protesters blockaded many towns and cities, including the capital La Paz, and confrontations between police and protesters frequently turned violent. 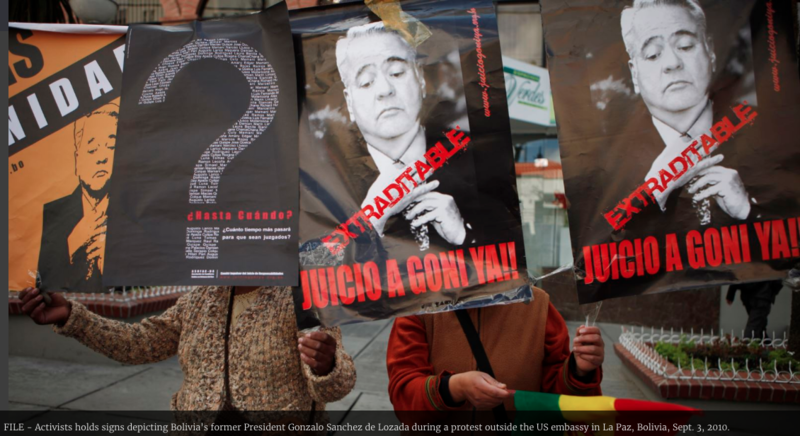 Joseph Sorkin, attorney for the Bolivian families, said he would show over the next several weeks of trial that Sanchez de Lozada and Sanchez Berzain were responsible for the deaths by authorizing the military to move in and halt protests by any means necessary. He said unarmed civilians were shot down in the streets and people killed inside their homes, including an 8-year-old girl. “The evidence is going to show that there was no plan to kill people. There was a crisis and the government had to respond,” Reyes told jurors. Reyes contended that the real blame lay with Morales and fellow protest organizer Felipe Quiste, rather than the former president and defense minister, because their real aim was to overthrow the government. “The men responsible for that tragedy are not in the courthouse today,” she said. Family members of the eight victims are expected to testify, as are Sanchez de Lozada and Sanchez Berzain, their lawyers said. Sorkin said the family members are relieved to finally get their day in court. An estimated 50 people were killed in the confrontations between the Bolivian military and protesters or civilians in September and October 2003. “They are honored to be here,” he said. This entry was posted in Bolivia, Politics, Social Unrest and tagged bad politics, democracy in peril, military in politics, turmoil, violent deaths. Bookmark the permalink.